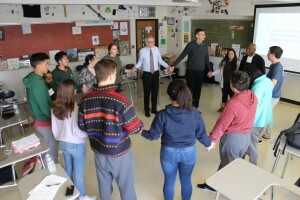 Walking hand in hand is an image that will remain with students in the Lasallian Region of North America (RELAN) who welcomed Brother Ghebreyesus Habte, FSC, Visitor of the Lwanga District of Africa, into their schools. 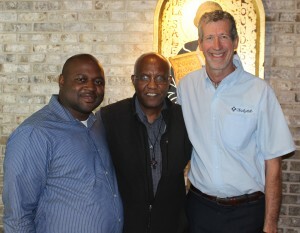 Brother Ghebreyesus, who used the same symbol during this 2014 RELAN visit, used that image to make a connection between RELAN students and Lwanga students who are served by ministries in the twinning program. Twinning pairs ministries in the Lwanga District with schools in RELAN to help students build relationships, while students in RELAN raise donations for fellow students in Lwanga. During the May 2017 visit, Brother Ghebreyesus visited 12 schools in the District of Eastern North America (DENA), the District of San Francisco New Orleans (SFNO) and the Midwest District, along with visiting District offices in DENA and Midwest and attending the Regional Conference of Christian Brothers (RCCB) meeting. At each school, Brother Ghebreyesus spent time learning about the school and students, shared his story and information about the Lwanga District and twinned ministries, and connected with students through activities, like playing basketball. Connecting through basketball, a favorite activity of Brother Ghebreyesus, is one experience he hopes students will remember long after his visit. “I hope my visits motivated and impacted them, making them aware of why they are sharing what they have with students far away in the Lasallian world,” said Brother Ghebreyesus. 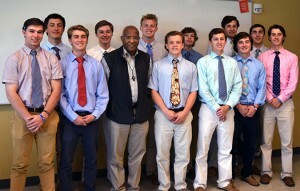 Brother Ghebreyesus’ school visits took him to Calvert Hall College High School in Baltimore, Maryland, Central Catholic High School in Pittsburgh, Pennsylvania, St. Joseph’s Collegiate Institute and Christian Brothers Academy in Syracuse, New York, Sacred Heart Cathedral Preparatory and De Marillac Academy in San Francisco, California, La Salle High School in Pasadena, California, Cathedral High School in Los Angeles, California, De La Salle Institute in Chicago, Illinois, St. Joseph High School in Westchester, Illinois, Montini Catholic High School in Lombard, Illinois, and Christian Brothers Academy in Lincroft, New Jersey. He also attended the graduation ceremony at Lewis University in Romeoville, Illinois, where Brother Moses Abunya, FSC, from the Lwanga District, received a degree.